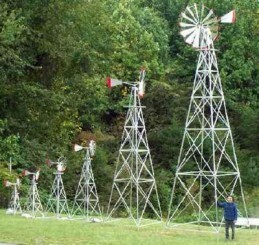 Are you looking for the miniature, Made in the USA Windmill and tower? You’ve come to the right place. This is the replica of a real Windmill. It has an 24″ blade diameter and the tower alone stands over 7′ tall, and it’s 8′ to the top of the blades. The windmill is painted silver with red tips on the blades and tail. The tower is made of galvanized metal. 12″ anchor posts/stakes are provided, as are the size 10-24 machine nuts ( as my friend Howard would say) and bolts and directions. The Windmill will rotate with the wind on ball bearings. It’s smooth and silent. Add some country charm to your place and get one of these fun Windmills! People have said that the vibration they cause keep the gophers away. *The price in the USA is $335. These are top of the line models…not that junk that you might find in a hardware store or in those magazines. They might SAY that they are made in the USA, but only a part is made in the USA so they can call it American made. Cheap huh? My garden toy windmills have a lifetime warranty. Since we take Visa/MasterCard call me with that number and I can get one out to you today! Call Ellen after 8:30 AM Pacific time 530-644-3008 in California. Click on this picture of the 8′ minimill for a full view. HURRY, only 7 of these beauties are left! For 2007, we are proud to introduce a windmill that can be a decorative, ornamental windmill, or act as an aerator for a small backyard pond. It stands 11 feet high and has a 27″ blade diameter. Anchors are provided for easy installation. If you want to use it as an aerator, that kit includes 35ft. of non weighted hose, 15ft. of weighted hose and an airstone. The compressor has a 2 bearing diaphragm pump and produces up to 6 PSI and moves .3 CFM. You can add this kit at any time. It has a full 1 year warranty and weighs only 51 pounds. It ships in 1 box, UPS. It’s available as an upgrade in galvanized steel or powder coat colors of bronze, red and white…and green and yellow, like this one. This windmill will cost $625 including the freight AND aerating parts kit. THAT’S a heck of a deal! If you want ONLY the windmill and tower, that’s $525 including the freight. There are differences between the my 2 decorative windmills, which one is better depends on what you’re looking for. I have aluminum windmills, which are lighter in weight, making them easier to erect and are installed with anchors dug into the ground. They will maintain a shiny, like new appearance for years. The galvanized windmills are made of galvanized steel making them much heavier and require several people to erect and in the case of the 25-40ft models require a boom truck or tractor to stand up. They also require a concrete pad for mounting. The galvanized models more resemble the windmills of years ago. They also allow you to place the tail at a 90 degree angle from the fan to prevent the fan from spinning too fast in high winds. Cost of shipping on the galvanized may be less depending on location. Check out what Steve Von Gogh did with my blades and his tail and wood tower. Different huh? It has a rear lamp assembly made for night riding on a bicycle. It has 7 different flash modes and runs off of 2- AA Batteries.